4 Person Co-Op Walker (W10396)-Sports Production-台州山水工艺有限公司官网,山水工艺,台州山水工艺,仙居山水,台州山水,Taizhou Mountain & River Art and Crafts Co.Ltd,Registered and established in 2006, Taizhou Mountain and River Crafts Co., Ltd is a storage trading company, also is the only one Sino-U.S. joint venture in Xianju County, which was jointly set up by the U.S.-based S&S Worldwide and Xianju Yikai Crafts Co., Ltd.
Our 4-person version is more challenging and is suitable for kids ages 9 and up. 60&quot; long, 5-3/4&quot; wide. 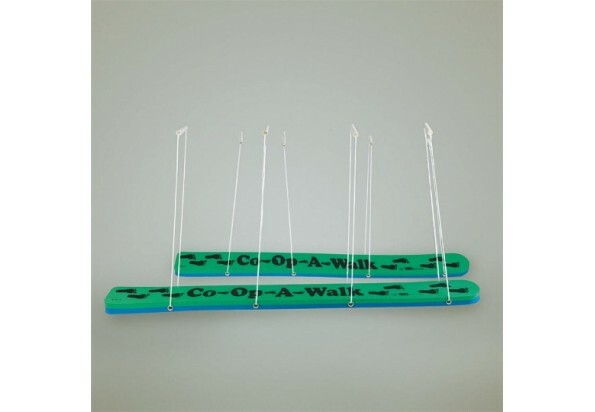 The only way to Co-Op-A-Walk™ Is to co-operate! We've re-invented our classic team-building item to be lighter and easier to store! They're great fun and exercise, as well as an effective lesson in teamwork and communication. New all-foam construction is much lighter in weight and easier to transport, while still highly durable. Perfectly safe, with no straps to bind feet and cause twisted ankles. Improved rope handle design is now features loops that are easier to hold and thread horizontally through the foam, positioning the rope directly under the foot. Our 4-person version is more challenging and is suitable for kids ages 9 and up. Made from tough 1.6"-thick EVA foam and weigh less than 4 pounds.